If you had to choose one building that summed up the fantasies and obsessions of Barcelona's turn of the century artsy nationalists, it would have to be this exuberant bouquet of a concert hall, where brick, stone, stained glass and tile are employed in the service of song and flowers. 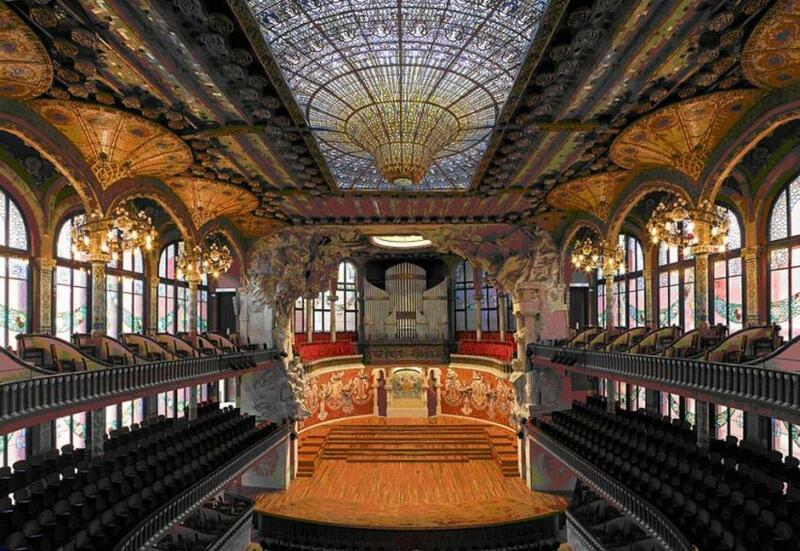 Flushed by its success at the Universal Exhibition of 1888, the Orfeó - Barcelona's most fervently Catalan choral society – bought this plot of land in 1904 and asked Lluis Domènech i Montaner to create a ‘Temple of Catalan art’. Domènech, who shared the Orfeó's ideals, didn't have to be asked twice, and hired the best Modernista artists of the day to create the perfect setting for the Orfeó's Catalan warbles. Perfection was costly. Domènech took a 20 per cent cut in his fee but still hadn’t been paid when the doors opened– a mere three years later. He was too cheesed off to attend the opening, but his masterpiece was a glittering success, winning the city’s prize for the best building of 1907. Yet a decade later, embarrassed Noucentista architects were calling it the shame of Barcelona, the ‘Palace of Catalan Junk’. Fortunately their calls for bulldozing it went unheeded, although a certain amount of remodelling has been necessary over the years, including a sympathetic restoration and extension in the 1980s by Oscar Tusquets. In 1997 it was designated a World Heritage Site. No one, however, has really managed to fix the famously bad acoustics. The narrow streets can barely squeeze in** the Palau's exuberance : the site never was big enough, but the Orfeò was keen that to remain close to their many working class members. The decoration celebrates Catalan music and musical heroes: Miquel Blay, a disciple of Rodin, sculpted the group blasting off the corner of the building in a meringue of legendary figures from favourite Catalan songs. 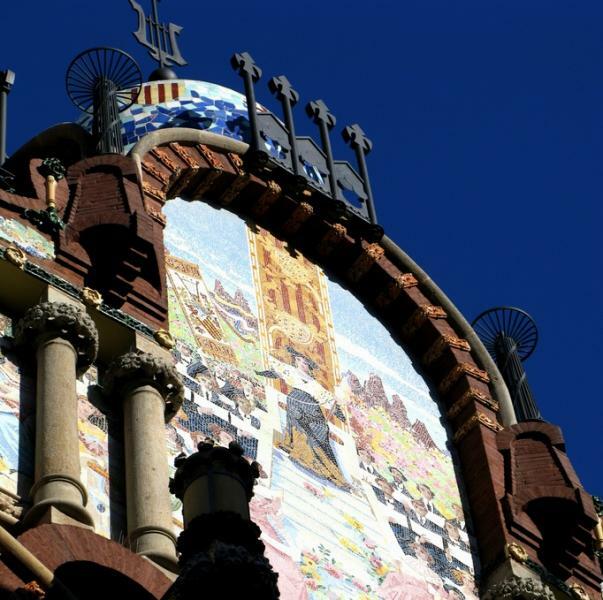 Eusebi Arnau's busts of Wagner (a big Catalan favourite), Beethoven, Bach and Palestrina decorate the second floor, while Lluís Bru's mosaics along the top of the façade illustrate members of the Orfeò singing in front of the Catalan holy mountain of Montserrat. The lobby is if anything even more lavish. A ceramic trellis with plump ceramic roses adorns the ceiling, while the banisters, encased in smoky topaz glass and surrounded with blooms, in honour of Amadeu Vives, the Orfeò’s flower-loving co-founder. It's all a prelude, of course, to the auditorium, an extraordinary hall of stained glass and ceramics. Because of the small size of the plot, Domènech wanted to fill it with as much natural light as possible, so he cunningly dematerialized the walls Catalan Gothic-style, but with a steel frame, making this the first curtain-wall building in Spain. Light streams in through Antoni Rigalt’s huge stained-glass skylight, illuminating the intricate mosaics fanning out across the ceiling like the splayed feathers of a peacock, amid a profusion of roses. The stage set is composed of 18 unforgettable half-tile, half-3D-ceramic maiden musicians by Eusebi Arnau, before a background of trencadis. Flowing pumice sculptures designed by Domènech, executed by Didac Masana and finished by Pau Gargallo face off across the proscenium : Beethoven with a bevy of crazed Valkyries confront the Orféo's other co-founder, Josep Clavé smiling serenely under a tree as maidens below act out The Flowers of May, his choral hit song. A bust of Amadeu Vives solemnly surveys the glassed-in room in the front of the palace. This was originally open to the street, so patrons could be dropped off at the Palau without getting wet, although the clatter of their cars and carriages drowned out the end of every performance. The chandelier is a copy of one spotted in a medieval French castle, and flowers are everywhere, whether in wood, iron, stone, glass or on the mosaics on the columns just outside. There are concerts nearly every night of the week from September to June—mostly classical, with a mix of Catalan choral, flamenco and avant-garde. The box office is open Mon-Sat 10am-9pm, and on Sunday and holidays (when there are no advance sales) 2 hours before show time. If you've brought the kids, there are family concerts on Sunday mornings. Hours 55-minute guided tours in several languages run every 30 minutes 10am-3.30pm; from Easter-July 10am-6pm, in Aug 10-am-6pm (but consult dates online. Adm €18, children under 11 free. Buy time-stamped tickets for the guided tour online, or at the box office (open 9.30am-3.30pm, or until 6pm in July and most days in August). You can also buy them by phone, +34 902 475 485.